It's a simple question: "Why not try Jesus?" 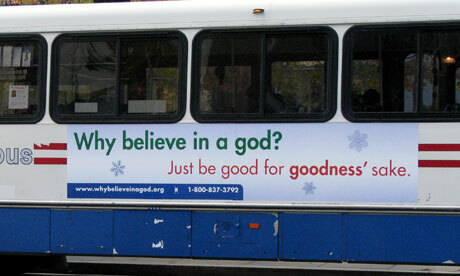 Equally simple is an opposite: "Why believe in a god?" Yet in the United States the first question is widely viewed as positive, or at least ordinary, while the second can be perceived as offensive and even hate speech. The sudden high volume of visitors to our special campaign website www.whybelieveinagod.org crashed our server twice. Soon, the conservative talkshow hosts were clamouring to give us air time so they could argue against us and further rouse their audience. And conservative Christian organisations not only denounced our efforts but encouraged their flocks to come bleat in our ears. All this before our bus ads actually started to appear one week later. By the beginning of December we'd received 37,742 hits on our campaign website, logged 638 new members and received over $6,000 in new contributions. Atheism is gaining popularity in the US (by some accounts, it is now more popular than bubonic plague). Now some atheists are discussing whether or not atheists should have their own church. After all, churches (particularly in America) fulfil a social function, distinct from their religious function, as centres of communities and bring people together (which, incidentally, is the literal meaning of the word "religion"), and with recent studies pointing out the health benefits of having a good sense of community, perhaps, the argument would go, it is time for a church for the godless? Many atheist sects are experimenting with building new, human-centered quasi-religious organizations, much like Ethical Culture. They aim to remove God from the church, while leaving the church, at least large parts of it, standing. But this impulse is fueling a growing schism among atheists. Many of them see churches as part of the problem. They want to throw out the baby and the bathwater—or at least they don’t see the need for the bathwater once the baby is gone. There are already vaguely churchlike organisations for atheists (or those with religious (non)beliefs indistinguishable from atheism): the article mentions the Society for Ethical Culture, a 19th-century "secular cathedral", and Humanist Judaism, which maintains the traditions of the Jewish faith but jettisons the faith bit. And then there are the Unitarian Universalists and other content-free quasi-religions. Not surprisingly, there is not only no agreement on what the new atheist creed is meant to contain, but also what it should call itself. Dennett sees value in atheism’s great awakening, in the energy and money that come from organizing, but he counsels caution. “The last thing atheists want to see is their rational set of ideas yoked up with the trappings of a religion,” he says. “We think we can do without that.” Even Richard Dawkins is not one to reject certain memes based on their churchly pedigree. He calls himself a “cultural Christian,” admitting that he likes to sing Christmas carols as much as the next guy. But there’s a limit to his tolerance of religion. While I can understand the arguments, the idea of an atheist church seems a bit absurd. For one, atheism is a purely negative belief, by which I do not mean that it is harmful or wrong, but that it is only a statement of what one does not believe. If I tell you that someone is an atheist, I am telling you nothing about what that person actually does believe; they could be anything from a Buddhist to a Marxist to a secular humanist, to say the least; the only thing you know is that their belief system does not include a personal supreme being. As such, atheism in itself is not much of a rock on which to found a church. Granted, one could beef it up with a range of complementary beliefs or values (such as beliefs in the beneficience of science, the innate dignity of the individual, the equality of races and sexes or the humour of Monty Python), though then it ceases to be merely atheism and becomes something else. Besides which, I doubt whether an atheist church could be remotely successful by any standard. Without the promise of eternal salvation (or some equivalent form of supernatural brownie points), going to church becomes just another activity, competing for time with a myriad possible other activities. Do you go to the Church of No God to hear a reading from Douglas Adams and then discuss it over tea and biscuits, or do you read a book or catch up with a friend or go rollerblading or see that new exhibition you've read about? Without the all-seeing gaze of the Almighty keeping tabs on His flock (or, more precisely, the common belief in such), such a church would more often than not take second place to other activities. In fact, the whole question of whether atheists need their own church appears, to me, to be the wrong question, particularly when attendance of mainstream churches has been declining in recent years. A better question would be how the social function that churches fulfil could be best fulfilled, in today's society, without religion. (The key phrase is "in today's society"; in a world where people move around much more than they used to, don't necessarily live amongst people who share their cultural or religious outlooks, and where communications are often mediated by increasingly powerful technology, such as mobile phones and the internet.) While these changes have led to the breakdown of traditional social structures, they are also ushering in new forms of social connection (as Clay Shirky describes in Here Comes Everybody), and it is far from clear that creating an atheist church would make any more sense than designing a new high-tech buggy whip. Read: Christopher Hitchens on Islamic fundamentalism, the marginalisation of moderates and humanists, and why the Saudis and their ilk are not our allies. And he's right; moderate humanism isn't very popular in Washington either. Not long before 11 September, the Bush administration was advocating "faith-based government" and praising the Taleban as allies in the war on drugs. Meanwhile, the Revolutionary Association of Women of Afghanistan are still persona non grata with Washington, who preferred to back the warlords and rapists from the Northern Alliance. The conflict is not so much framed as "humanism vs. zealotry" as "our god vs. your god"; the God-given manifest destiny of America vs. the will of Allah. Which sounds like nothing so much as a debate between paranoid schizophrenics. Only the schizophrenics have armies and nuclear missiles and zealots willing to kill and die on their word. The real conflict would be between enlightened, tolerant liberal (I'd say libertarian, if the word hadn't been taken over by the Ayn Rand cult and like-minded zealots) humanism (i.e., the values we should export to all who seek them) and the belligerent, atavistic ignorance of every thug, tyrant and dictator. Though our leaders have sided with the thugs too often. Or, to quote an entirely different holy book, "Death to all fanatics!"